A while ago we bought an old fridge and restored it, so it would fit nicely in our gameroom. 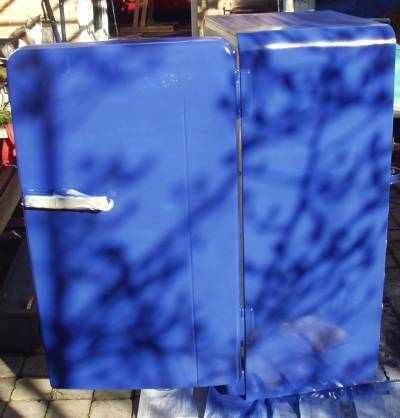 Here's the tutorial about how we did this, as a lot of people are interested into restoring retro fridges, or just to give the plain white fridge (or other kitchen appliance like a freezer, dishwasher, ..) a new look so it'll blend in more in the kitchen. When we installed a new (bright red) kitchen, we had our Smeg fridge professionally painted in the same color as our kitchen cabinets. It looked great, it's a perfect color match, it's clearcoated so doesn't scratch fast, however this paintjob cost us more than a regular plain fridge would have cost us new ! So when we bought a retro fridge for our gameroom, we didn't want to spend as much money on it and try to repaint it ourselves. It wasn't going to be perfect, but it would be a lot cheaper, and as the fridge would get decals anyway, and is in a rather dark room anyway, it didn't need to be a flawless paintjob. 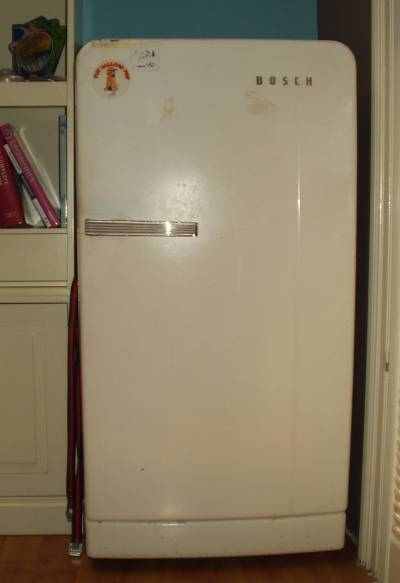 Here's the fridge we bought. It's a Bosch, probably made somewhere at the end of the sixties, early seventies. The door isn't completely flat, it's rounded, and it has a cool chrome doorhandle. That's what we were looking for in a retro fridge ! As I don't know anything about repairing fridges mechanically, we did check that it worked fine ! 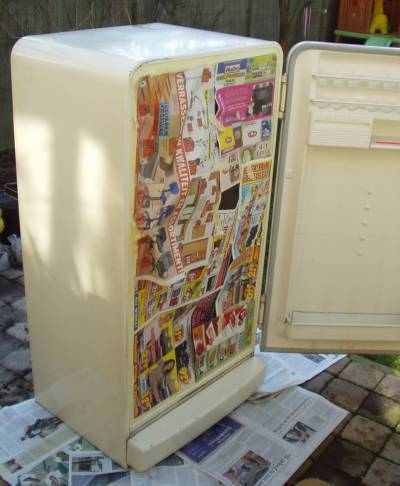 Don't buy a fridge that doesn't cool if you don't know how to repair it ! 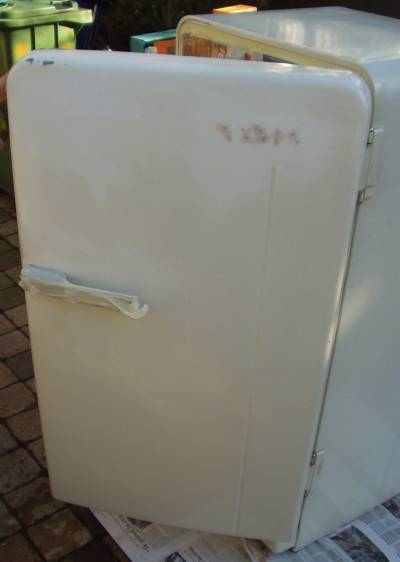 (some old fridges can be repaired, but some of them are just broken and unrepairable). One tip: there's a little switch that gets pushed in when you close the door. On a lot of old fridges the door is broken at this place. The result is that the light will stay on even when the door is closed, this will heat up the fridge and it'll keep on running.. so if you buy a fridge and the owner complains it just keeps on running and doesn't turn itself off, check the door switch.. The old decals have been removed. The BOSCH logo was removed, a dent and the little holes have been patched using a product to repair dents in cars. This has dryed and is sanded smooth. The whole fridge was sanded and cleaned. Before you can repaint an old fridge or other appliance, you have do thorough clean the surface. I washed it so all dirt was off, then I sanded the old white paint lightly (use something like 120 grit sandpaper), so it wasn't very shiny anymore. That way the new paint can attach itself well. After that you really have to clean it well so all dust from sanding is gone. Either wash it and let it dry long enough, or use something like synthetic thinner to clean it. Holes, dents, scratches all need to be filled up. Use a product to repair dents in cars, shape it about right, let it dry, and then sand it very smooth ! First sand it with 120 grit, then smoother and smoother (up to 600 and even 1200 if you really want to do a perfect job). You shouldn't be able to see any imperfections, scratches, edges of where you filled something, as you will still see it when the paint is on. If you want a perfect paintjob, preparation is about 80 percent of the work involved ! Ready for painting.. tape off the rubber seal of the door, tape off the inside, .. so you don't get any overspray on it. Now paint ! A lot of people make the mistake of not shaking spray cans enough. It says to shake it 2 minutes and they shake 30 seconds.. read the instructions on the spraycan and follow them ! Note the spraycan is held a bit too close to the fridge in the picture, but as there was quite some wind, we had too many overspray otherwise.. If you want a perfect paintjob then you don't spray when there's any wind.. also keep the spraycan a bit further away so you spray a nice, even coat of paint. The first coat is done. Not perfect though as you still see some color differences. This is fixed with a second coat of paint (within a few hours, read the instructions on the spray can). 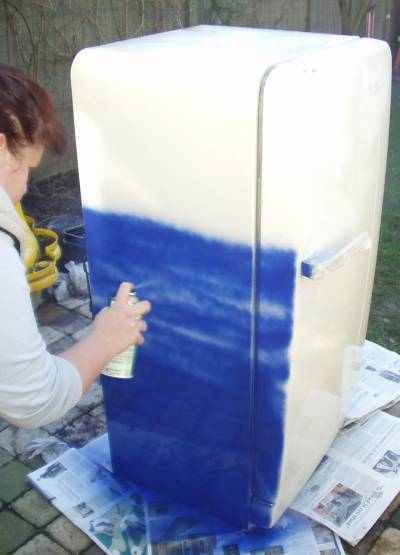 Once the color is right, you have to make the paint itself smooth, so the fridge becomes shiny. To do this you use a car polish. This will make the surface of the paint smooth. Be sure you've let the paint dry enough (a few days) before you polish it ! To make the surface really smooth and shiny, and to protect the paint, you can clearcoat it. Use a clearcoat in spraycans, use the same steps as when painting - degrease, spray, let it dry and polish if necessary. If you know in advance you will clearcoat, you should not polish the base paint. Only polish the final clearcoat. Here's our finished fridge. 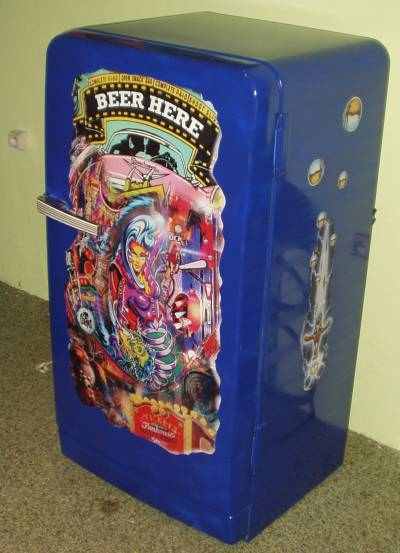 We wanted to turn it into a special pinball related fridge. Our first idea was to have it airbrushed. But airbrushing large things like the door of a fridge is quite expensive.. and not every airbrush artist is as good as he thinks he is. Therefor we had large decals printed. Using photoshop a friend made this collection from pinball-related photographs and we had it digitally printed. 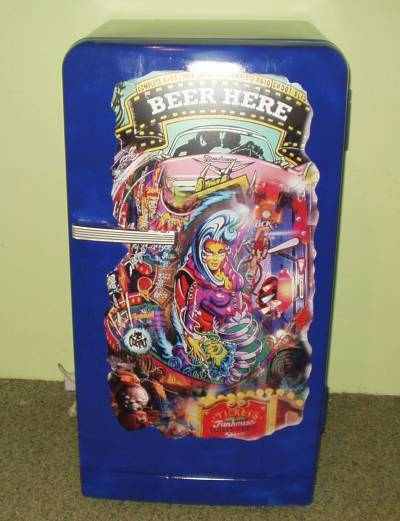 Even the sides of the fridge have decals on them - the sword from the Medieval Madness pinball machine cabinet, with the reflective pinballs from Twilight Zone pinball cabinet circling it. One final touch I'm considering doing is to extend the lightning around the sword into the blue color of the fridge.